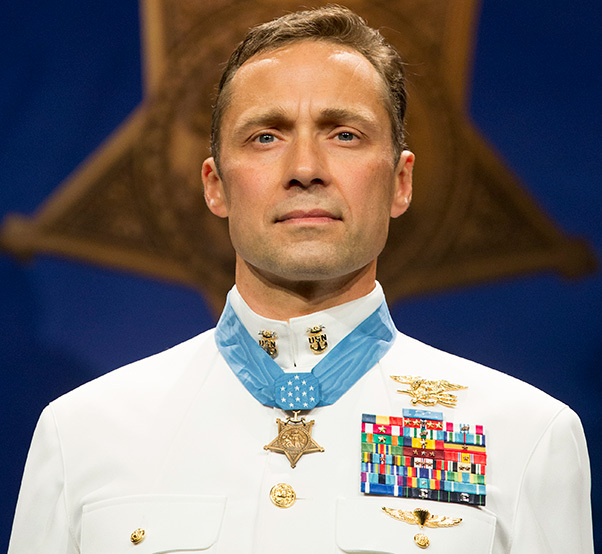 Medal of Honor recipient retired Master Chief Special Warfare Operator (SEAL) Britt Slabinski stands on the stage during his induction ceremony into the Hall of Heroes at the Pentagon Auditorium. Slabinski was awarded the Medal of Honor by President Donald J. Trump for his heroic actions in March 2002 during the Battle of Takur Ghar while serving in Afghanistan. 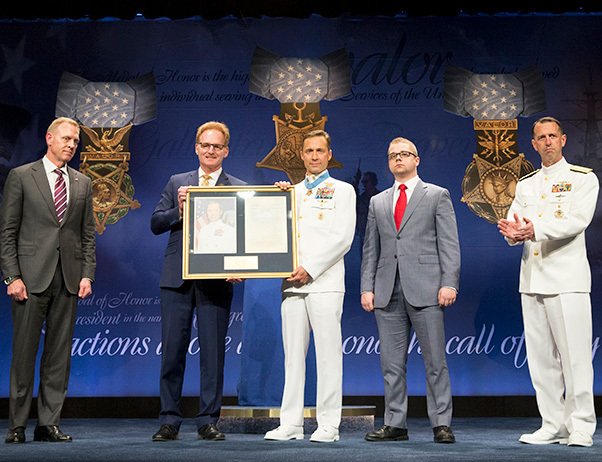 On May 25, Medal of Honor recipient retired Master Chief Petty Officer (SEAL), Britt Slabinski was inducted into the Pentagon Hall of Heroes during a ceremony held in the Pentagon auditorium. President Donald J. Trump presented Slabinski the Medal of Honor during a White House ceremony the day before for his actions while leading a team under heavy effective enemy fire in an attempt to rescue teammate Petty Officer First Class Neil Roberts during Operation Anaconda in 2002. Deputy Secretary of Defense Patrick M. Shanahan, Under Secretary of the Navy Thomas B. Modly, and Chief of Naval Operations Adm. John Richardson spoke at the Pentagon event. Modly also praised the courage of Slabinski for his actions in Afghanistan more than a decade ago. “He represents the humility and quiet dignity of all SEALs, a warrior spirit of uncompromising integrity,” added Richardson. After their remarks, Slabinski was joined by his son Bryce, Shanahan, Modly, and Richardson for the presentation of a Medal of Honor Flag and a Hall of Heroes plaque. Then, with family, friends, former teammates and top military leadership looking on, Slabinski took the podium and delivered his remarks. Under Secretary of the Navy Thomas B. Modly and retired Master Chief Special Warfare Operator (SEAL) Britt Slabinski hold Slabinski’s Hall of Heroes plaque during the Hall of Heroes induction ceremony Friday, May 25, 2018 for Slabinski at the Pentagon Auditorium. 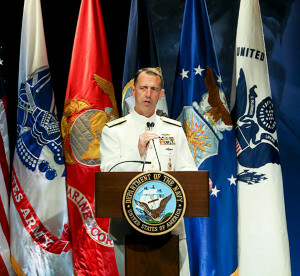 With Slabinski and Modly are Deputy Secretary of Defense Patrick M. Shanahan, left, Slabinski’s son, Bryce, middle, and Chief of Naval Operations (CNO) John Richardson. Slabinski was awarded the Medal of Honor by President Donald J. Trump for his heroic actions in March 2002 during the Battle of Takur Ghar while serving in Afghanistan. The Hall of Heroes is dedicated to the more than 3,460 recipients of the Medal of Honor. Along the walls of the room are the names of each recipient. All three versions of the medal – the Army, Sea Service (Marine Corps, Navy and Coast Guard), and Air Force – are displayed in the Hall of Heroes. An asterisk next to some names represents service members who received two Medals of Honor for separate acts of bravery. Dots are used to signify Marines who were under the command of the Army during WWI and received both the Army and Sea Service versions of the medal for a single act of bravery. Slabinski’s Medal of Honor is an upgrade of the Navy Cross that he was previously awarded for his actions. Former Secretary of Defense Ash Carter directed the military departments to review all Service Cross and Silver Star recommendations for actions since Sept. 11, 2001, to ensure service members who performed valorously were appropriately recognized. Chief of Naval Operations (CNO) John Richardson delivers remarks during Medal of Honor recipient retired Master Chief Special Warfare Operator (SEAL) Britt Slabinski’s induction into the Hall of Heroes during a ceremony at the Pentagon Auditorium. Slabinski was awarded the Medal of Honor by President Donald J. Trump for his heroic actions in March 2002 during the Battle of Takur Ghar while serving in Afghanistan. Slabinski, a native of Northampton, Mass., joined the Navy in September 1988. After graduating from Radioman Class “A” School in San Diego, he completed the Basic Underwater Demolition/SEAL course in January 1990. He retired in June 2014 as the director of Naval Special Warfare Safety Assurance and Analysis Program after more than 25 years of service. Throughout his career, Slabinski was assigned to both West and East Coast SEAL teams and completed nine overseas deployments and 15 combat tours.